In 2010, a friend, Mike McNiff, and I wrote a small book called Becoming Bulletproof. That small book started and grew into what is today the Original Strength System. The purpose of that book was to teach people how to “press reset” on their bodies and restore their ability to live life the way they wanted to. The book got its name because, thankfully, Becoming Batman was taken. Mike was a huge Batman fan… I, however, have always wanted to fly and Superman is my favorite hero. That little book changed my whole world. I like to think it changed everyone else’s world too. Anyway, for me it started something that has been an ongoing process. Since the time I wrote that book I have learned that our bodies are a work of art and they are indeed made to be super, full of power, and capable of amazing things. I’ve learned that we really have no limits other than the ones we place on ourselves through erroneous beliefs and misplaced acceptance of the status quo. And what I’ve come to believe is that we were each created to be a superhero; not someone who flies around in tights but someone who does amazing things through their determination and their physical abilities. We were all created to save the day. We have been given a mind capable of creating any possibility, a heart filled with inexhaustible desire, and a body able to accomplish any feat. But there is a self-discovery process to realizing this. I can’t just tell you that it is so. It must be experienced to the point that you know it is so. Otherwise, I’m just a noisy, clanging symbol spouting out foolishness. Enter The Becoming Bulletproof Project, my new book. The more I learned from engaging in the movements and thoughts inside of Becoming Bulletproof and the more capable I became, the more I believed I could be Superman. Then there became a point where I believed I was supposed to be Superman. And then there became a point where I believed I was Superman. I know this sounds like I’m crazy, but don’t turn that dial just yet. We each have enormous potential inside us and we were each created for a purpose. After all, there would be no point in being full of limitless potential if we were never intended to use it. Right? The point is, you are a hero. You have super powers. You may not know that yet, but it doesn’t mean it is not so. 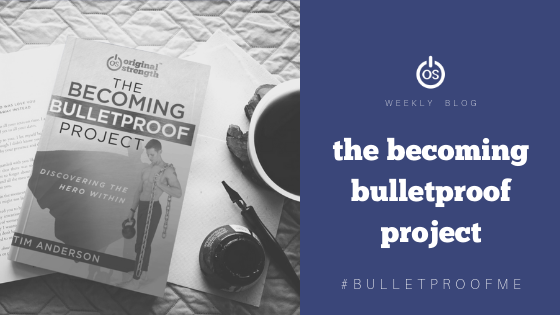 The Becoming Bulletproof Project is written in the hopes of helping you realize who you are. It is full of lessons I have learned and trainings I have done that helped me gain this understanding. In fact, it’s full of the training wisdoms of John Brookfield, the Father of the Battling Ropes Training System. He is a man without physical limits, a modern-day Sampson. He took me under his wing and showed me how to remove all mental and physical limits. In other words, he helped me realize the power and potential that was already inside of me. It’s in you too. This book is about helping you discover who you are and how much potential you have. It’s not about ego or about being better and stronger than everyone around you. It’s about knowing you; discovering the hero within yourself. It’s a process that you’ve likely already started if you’re a regular reader of this blog and you Press RESET often. Anyway, you are a hero. You are here to save the day. You are able. But again, you have to discover that for yourself. Are you ready? The Becoming Bulletproof Project: Discovering the Hero Within is available on Amazon starting today. Thank you so much for purchasing our new book and for sharing it with your friends! And, thank you for your continued support of Original Strength. I just ordered the book to join my library of other great OS books. I hope that I can nudge you to put together the best of your movement snacks into a DVD. OS is the best program ever! Thank you, Joe. I do appreciate that! And thanks for the nudge – that’s a really great idea.